So here we are again. “[I’ve] had a birthday, shout hooray….One year older, and one year older”… as my modified version of the Primary birthday song goes. For those of you new to my life in the last few years, when I turned 30, I thought it would be funny to post a blog about why I was still single at age 30. So you can get started there with some background on why I do this. And then I turned 31 and, well, I was still single, so I thought it would be fun to blog about it again. (See 31 Reasons). So you see, it’s kind of a tradition. But it’s also hard to keep coming up with more reasons! As I approached the morn of my 33rd birthday, I still didn’t have this list completed. So guess what happened? My body naturally woke me up at 4:30 AM today. And I couldn’t get back to sleep. My mind was SO AWAKE. Why? Because it was racing with ideas of what to include in the blog because I knew I had to post it today. When writing a blog about why I’m single becomes more important than sleep, I *think* that means I have a problem with priorities. But you have a completed blog, so someone wins in this situation. My co-workers really enjoy reading my “single” blogs. They’re so invested in it that they started coming up with reasons I’m still single. I’m so grateful other people can tell why I’m single, too…? One of their ideas: The dryer ate my match. (He’s probably hanging out with all the mismatched Tupperware somewhere, too). So I told a friend about that set-up and that I didn’t know if I even wanted to go out with him again anyway, so I wasn’t that disappointed (self-preservation, much?) and, and, and… “Dating is just so complicated!” My friend said it wasn’t complicated. Apparently, I choose to make it complicated. So there’s that, I guess. I’ve only gone on two dates in 2018. On a blind date, the dude found out that I enjoy sport shooting and hunting. “Wow,” he said. “I totally stereotyped you, but I was wrong.” The only stereotypes I feel like I have ever fit into really well are “Teacher’s Pet” and “Pharisee”, but he didn’t know enough about me to gather that much info… So now I’m left to wonder what other stereotypes I “fit” into but actually don’t fit into? And how much have I been fooling people with who I am? I realize you think that’s cheating for me to put Mutual as its own number on the list. Mutual, for those who don’t know, is a dating app for Latter-day Saints. Its premise is you see a profile and picture/set of pictures and you swipe up if you like someone, down if you don’t. If you both swipe up, you match, and then you can message each other in the app. Mostly I use Mutual so I can prove to God that I’m doing something about trying to get married. 30 swipes a day keeps the dating guilt away. You can actually pay for Mutual instead of just using the free version, but based on my experience with paying for dating sites/apps, the ROI is pretty low. I beat the Mutual game anyway. How do you beat the game? Well, a guy friend challenged me to do this, and I’m generally up for a challenge if it will give me good blog content. Here’s how you beat it…. Swipe through every single person on Mutual. This takes a significant amount of time, but not as much as you’d think. I started doing this around March/April, hoping that I’d beat the game by this post. I got through everybody by May. You just have to become a dedicated time-wasting swiper. I did have some parameters. I narrowed my selection down realistically, to a plus or minus five year age range. I opened up the location range to infinity, though, which means…anyone on the whole planet Earth who gets on Mutual. So back to swiping, you just go through everybody. The screen will tell you if you’re out of matches. But that screen is a lie. If you just exit the app and get back in, more matches will pop back up. If you get a completely blank white screen, that means for realsies you are out of matches for the day. Or if you do close out and get back in and you still get the “no more people” notice, then that means Mutual is temporarily working as it was designed and there really are no more people. So once there are no more people left, you only have to open the app once a day and swipe through only those who added that day. My hypothesis was this would be an advantage because the newbies aren’t as careful in their swiping and might actually swipe on a normal (read: not super hot or blonde) looking girl. And they might even message her. Also, the newbies are far less likely to have gym selfies, shirtless pics, or bro tanks right off the bat, so I’d be more likely to swipe on them. How do I know all this? I recorded about a month’s worth of data on all the guys who were new on Mutual. Yes, I’m going to blog about it someday. Why else would I do it? The average number of guys who added on during that time frame was 30 per day. The average number of people I swiped up on was 7 per day. The average number of men I matched with was was 1. OK, that was really the total. Of all the swiping during that time. So, you say, Liz is just picky. Ha! I tricked you into letting that be another reason. So, OK, I’m picky. Yeah, I’m glad all you married people weren’t picky when YOU got married. I hope you are all just confidently saying to your spouses, “I’m so glad I wasn’t picky when I chose you…I just took what I could get.” Ha. No. This was like two weeks ago that I did this, guys, so I’m still tentatively messaging that guy…very tentatively. But, per the usual Mutual glitch, I just realized yesterday that Mutual deleted the last message I sent. One job, Mutual. One job…I keep telling you. Around July-ish, I was fed up with Mutual and I did what most online dating users do. I deleted it and gave myself a break. This is just something we all do every 2 weeks to 2 months so that we don’t go insane. Anyway…I had two guys I’d been messaging a bit so I just gave them my phone number and told them that I was deleting the app but thought they seemed nice and I’d be interested in texting them. I’m so naive sometimes. Him: What are you looking for? Me: Um…too much for us to talk about via text, but the same thing most normal people are looking for on this. It just hasn’t been that effective for me. [FYI for my readers…even many of the Latter-day Saint people are just looking for make-out buddies (and other such things) on these apps. Lest ye wonder what I am looking for, I am looking for Twoo Wuv]. Him: Of course all of this is if you even care at this point which you may not and that’s 100% fine. But if I was [sic] talking to my best friend and they [sic] wanted more success online, there are things I would suggest that have proven to work. Once when I was at Lake Powell, a group of us went cliff jumping. We hiked up to our spot about 40 feet above the water. There was a bush just to the side. Little did I know there a bunch of lizards under it [sic]. When I started to jump they scattered! One got in my path and threw off my jump. I went head over heels all the way down. I guess the point is, this isn’t the first time I’ve fallen head over heels for Liz! So I didn’t respond. One week later. Him: “I guess I fell head first into A-dam.” (Sorry, I usually don’t post names, but he was the one who created a play on his name). I had sensed he had been holding back but I assumed that was just the long-distance/email thing going on. I need to improve my Spidey-senses. Since we definitely weren’t anything because we really were only emailing and we really only went on one date, I definitely did not cry over this. (I totally cried over this). And most definitely, we are not friends. But also most definitely, I’M A TOTAL PANSY and we are still friends. Not like “friend-friends” (because who really has those in their 30s anyway?) but more like friends who share good book recommendations with each other. But wait, you say! Surely knives were not all that remained. Surely there must be something else…something new…like an InstantPot!! Hardly. Amazon Prime Day is much easier than waiting for a future wedding registry. I am attending a conventional (aka family) ward. 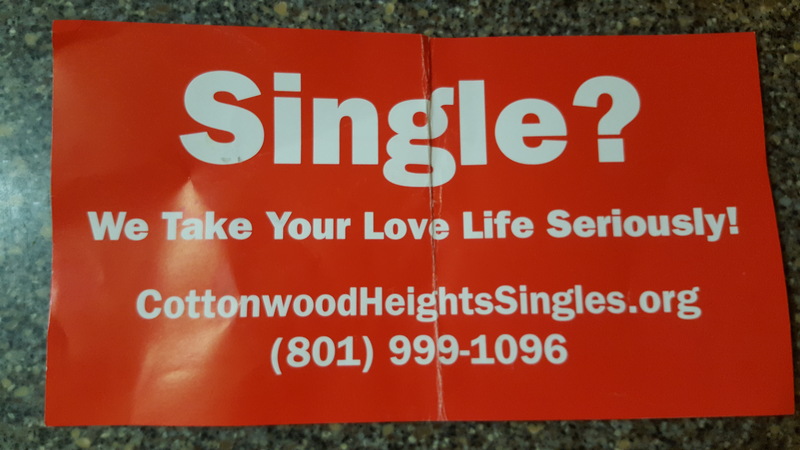 When I left the young single adult ward, I decided not to try out the singles ward (commonly referred to as “midsingles”). Personal decision. And personal reasons. But I sure know people who believe that I’ve given up and that I’ll never marry someone because of that choice. And sometimes I feel that way, too. BUT, I rocked the YSA ward for basically 12ish years and never got married so…tell me again how a ward is going to get me married? Now, every once in a while, I’ll still go to “midsingles” activities. I have gone to the singles conference in Salt Lake City before, but this year we had a little family vacation planned that same weekend. My “big” chance to meet new and different single people? I was floating down a river with my family. My mom would have been mad if she knew I turned down going to that conference to go on a small family camping trip. So I definitely didn’t tell her. Hi mom! Now you know. I stand by my choice. Someone gave me this flier. I never called. 31. A few years ago, research showed that the average age of marriage of Utah women is 24 years old. In the whole US of America, it’s 27. Now call me prideful, but I’ve always considered myself a little above average. 32. 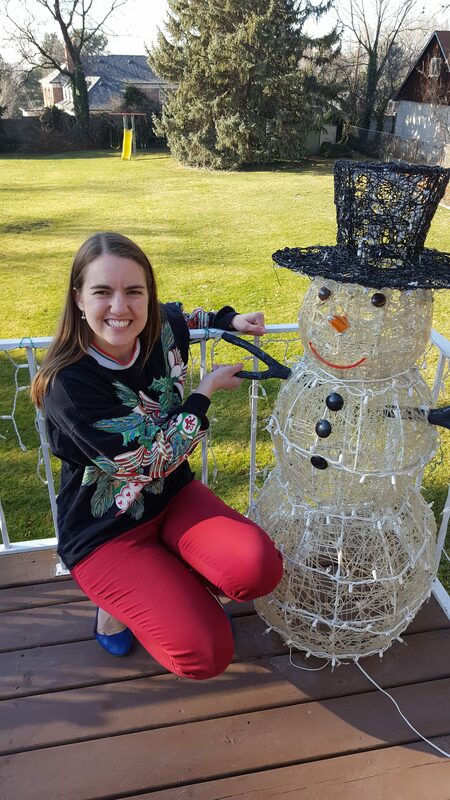 I STILL haven’t found someone who really and truly appreciates my Christmas sweaters (except for this snowman). 33. And finally, I should just confess. You know all those chain letters and emails back in elementary school? The ones that said if you didn’t forward them on, your crush would never talk to you? I never forwarded them on. So that wraps it up for this year, friends. I know. I really do. But I also enjoy poking fun at myself and at what the dating world has become. I am (mostly…OK, sometimes) OK with how things are. And even if I’m not, as Marjorie Hinckley said, “The only way to get through life is to laugh your way through it. You either have to laugh or cry. I prefer to laugh. Crying gives me a headache” (Glimpses into the Life and Heart of Marjorie Pay Hinckley (1999), 107). And, you know what? I actually have an extremely blessed life and can’t complain much. Sometimes it even seems (shhh…don’t tell anyone I said this) easier to be single. And “being single” is fairly low on the list of my biggest struggles in life. But I still work for what I know I ultimately want out of life. And as I’ve struggled with some of my decisions (such as moving to a new area and not going to the midsingles ward) and so forth over the last year, I have felt some pretty strong heavenly inspiration telling me, “I know where you are. And I know where to find you.” This has brought me so much comfort. I really do believe God knows where I am. And I believe He has me exactly where He wants me right now. And I will know if I need to change things up. So if I’m going to be single, I’m going to use that for God’s gain, which is ultimately my gain anyway. Being single, I know that I’ve been given “extra” time to share. And I’ve made a commitment to God that I will use that time, those extra resources, and my talents to bless and help others. If I am to be single for now, for another year, for five years, for however long, I am not just waiting around feeling sorry for myself. I’m building a fun, service-filled, people-filled, family-filled beautiful life. Besides, none of us is living the life we expected we’d live. That would be awfully boring anyway. So, in all of it, I simply choose to just trust in God. He’s given me way more opportunities and experiences and relationships in life than I could have ever imagined for myself anyway. Cue my fave songs to listen to on repeat when I need that reminder. Also, if someone wants to set me up with David Archuleta, I will not be sad. This is Liz on Liz Writes This, and I’m signing off. Oh man your posts are hillarious! I can completely relate to the pointless to app mutual is, even if the glitches didn’t exist. I just barely moved into a mid single ward about 6months ago. I’m definitely overwhelmed and lost in the ward (but I love the spirit) and know it’s where I need to be for whatever reason that is (although I’ve definitely contemplated moving to a family ward). Anyways love your blogs when I remember to come stumble across them!